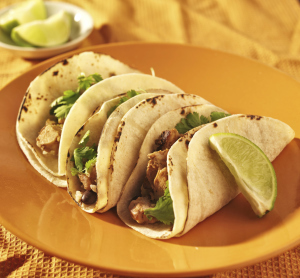 For many Americans, when one thinks of the word “tacos”, they think of the crunchy hard corn shells, and when they hear the word “soft taco” they think of large fluffy flour tortillas wrapped around a variation of beans, cheese, veggies, and meat. But the street taco defies such expectations. These are the smaller, more agile tacos that are adapted to life on the street and make up for their small size with greater flavor and numbers. You may have gotten such fare from a taco street cart and been surprised about the differences from a traditional American burrito. Usually coming in groups of two or three crowded onto a plate, these soft corn tacos fit comfortably in a single hand. Street tacos are almost universally open faced, showing off their various contents, and are folded and consumed in a handful of bites. Many street tacos come with an extra soft taco stacked under the first, allowing some of the contents to be shifted to more manageable and cleaner bites. The history of the street taco can be traced all the way to the roots of the taco as a Mexican meal. Much as the sandwich is often proclaimed as the working man’s lunch, these original tacos were wrappings for the day’s meals, allowing them to be eaten quickly and with a minimum of fuss when concerning utensils or eating surfaces. As urbanization took over, families would make these tacos to bring into the cities to sell to workers, and thus the street taco was born. Below are two of the most common types of street tacos you’ll find in the United States. You may have even eaten one in the past. Probably the most famous style of street tacos in America, the fish taco can use a variety of fish from cod to salmon, though tilapia is probably the most well-known. The fish can be breaded or just seasoned, and is served with pico de gallo and cabbage, which is sometimes tossed in a sauce. Most traditional favorite of street shops and vendors will have some variation on this slow-cooked, spiced pork. This dish can take up the centerpiece of many shops, complete with a giant spit of seasoned pork that is carved off for each taco. If you came here with the question “what is a street taco?” we’re glad to have provided an answer for you. If you’d like a more hands-on answer and are in the neighborhood, please stop by our Casa Blanca Mexican Restaurant locations in Andover, North Andover, and Billerica for these delicious street tacos and other traditional Mexican cuisine.